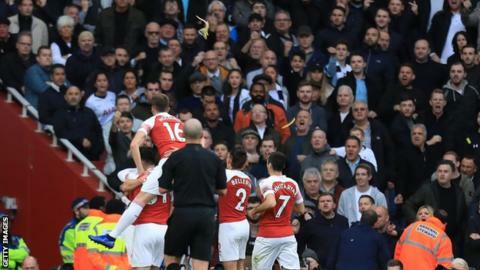 The Tottenham fan who threw a banana skin during the north London derby at Arsenal has been banned from football for four years and fined. The banana skin was thrown from the away end when Pierre-Emerick Aubameyang scored for the Gunners, who won 4-2. Averof Panteli, 57, admitted throwing a missile but denied there was a racial element to his action. Van driver Panteli, of Norwich, was fined £500, which was increased by £100 for the racial element, and told to pay £135 in costs. His solicitor, Leila Rasool, said Panteli had been going to Tottenham games for 50 years without incident and was of “exemplary character”. She told the court: “He has not been charged for any racially aggravated public order offence. “He was arrested for that but no action has been taken in respect of that matter. Speaking outside court Panteli – who has already received a lifetime ban from the club – said he would “100%” regret his actions for the rest of his life. “If there’s anyone that needs me to apologise to I will. Ian Wright, Aubameyang, Arsenal players, Tottenham players and especially Tottenham the football club and my fellow Tottenham fans. I’d like to apologise to them, it wasn’t meant to offend anyone whatsoever,” he added.